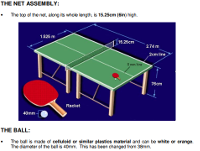 This modified version of the table tennis rules is presented in an easy to read format so you can easily find out the most important rules to know about the game. You can also pull this handy PDF out to resolve and disputes that may arise. 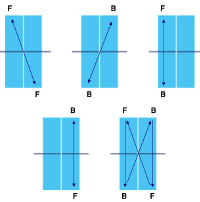 We also have an entire series of videos you can watch for more information on the rules of table tennis. 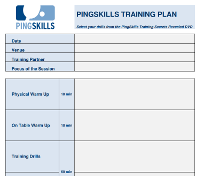 The PingSkills Training Plan Template is the perfect document for planning out your training session. It ensures you have a focus for your session, and provides you with a standard layout to ensure you are thinking about all aspects of your improvement. In fact for eachof our lessons in the 52 week training plan, we use this template! Download a copy of the PingSkills Training Drills so you can select the best routines to use in your own training. For more information on each drill and to see it in action, watch our video course called Training Secrets.